My husband was a tad disappointed the first time I made this, since we’d bought a deluxe amaretto for it, and he felt like you couldn’t taste it enough when it was added to the cake. Good point- so much of it bakes away, and almond extract would produce the same results, for probably less money. So next batch, I added the amaretto to the candied orange peel. Whoa- THAT was good! Here’s a cake recipe that’s quick and easy enough, but still delicious (& slightly healthier than average! 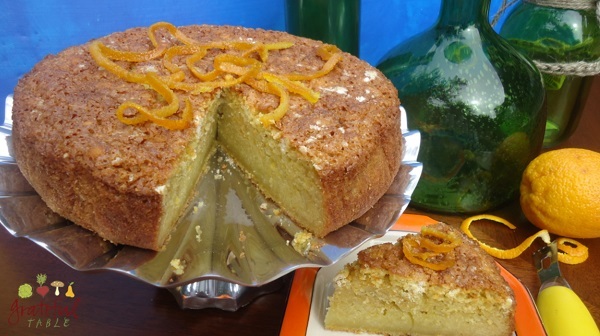 )- a moist cake with a fresh orange flavor and slightly crunchy texture from the cornmeal. Traditional Italian recipes might add some Amaretto to the cake; to preserve more of the liqueur’s flavor, it can be added to the orange peel garnish. (Unless serving the under-aged, that is!) Serves 12. 1. Preheat the oven to 350 degrees. Press foil into a 9” spring form pan and coat with olive oil and flour. Or, use two 9-inch round cake pans, which won’t need a foil liner, but which should still be coated with olive oil and flour. (If using two pans, they’ll bake faster.) Tap out any excess flour. 5. Add egg mixture to the dry ingredients, stirring until just blended (the batter should still be slightly lumpy). Pour the batter into the prepared cake pan(s). Bake until a toothpick inserted into the middle of the cake comes out clean, about 40 to 50 minutes. Remove from the oven and let the cake cool, then run a knife around the edges of the pan and turn it out onto a serving plate. *I wasn’t thrilled with my experiment substituting masa flour (which I had) for the corn meal (which I didn’t have on hand). Most bloggers claim success with the switch, but I would say, approach that idea with caution!. Easy, Healthier “Chocolate Graham Cake” Recipe, Paleo-ish! Chocolate Cake w/Beets: Not Quite Red Velvet, But Delicious!